Councilman Griggs will be on his bicycle riding along side other city hall leaders at this year’s annual Bike To City Hall event. An original BFOC member, Scott has been the biggest advocate for helping to bring bicycling into the mainstream as an important transportation issue in our car-centric city. Along with Councilwoman Angela Hunt, he’s championed the creation of safe travel into Downtown on the Jefferson Viaduct, and here, and is leading the charge to connecting the Trinity River basin. We encourage all our bicycling advocate partners to organize their own ride to our Main St Garden meetup location before we head to City Hall. Description: There’s a lot to celebrate this year – from the addition of bike lanes and sharrows downtown and at Rosemont Elementary, to the projects in North Dallas and Deep Ellum. As we continue to make progress with the Bike Plan, let’s take this day to show City Hall how proud we are of the new updates to our communities and for our Council Members’ continued support of this initiative! This year we’re updating our initial meeting location so we can bike the new shared-lanes to City Hall! Cyclists from all corners of the city are invited to meet us at Main Street Garden by 8am. At 8:15am we’ll all head up to the City Hall Plaza for a quick press conference including an update on bike plan progress and a rally of grassroots support from our most vocally supportive City Council representatives including Scott Griggs, Mayor Rawlings and others (Have you asked your Council Rep to show their support?) We’ll wrap things up by 9am so folks can head off to work and all. Join us in this demonstration of the strength of our cycling community and our massive support for a bike friendly city. 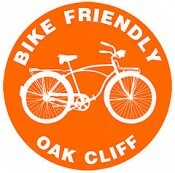 A Bike Friendly Oak Cliff group will head out from Oddfellow’s around 7:30am. Check the blog comments for other group rides from your neighborhood, or start one and post it in the blog comments! Looks to be a great ride with some city officials who really care about the bike culture in Dallas. Oil up those bike chains and LET’S DO THIS!